We would like to help you with your interior painting project. When we are done everything will be as clean as cleaner than we found it and your home will have a great looking durable finish. We are cost effective and we save you money by doing the job right, helping to solve problems, and saving you time by being easy to work with and professional. We offer a wide variety of protective, artistic and architectural coatings. These include faux finishes, staining, Venetian plasters and Italian plasters. The options are endless and your ideas can become reality. Whichever finishes you choose, the basic principals apply, we respect your time, provide you updates on your project, and work closely with you to create a home environment you'll enjoy for years to come. We paint homes, condos, townhouses and commercial projects throughout the Atlanta, GA metro area. Most of our paint jobs are in the Alpharetta, Roswell, Marietta, Atlanta and Sandy Springs areas. Your home's floors, fixtures and overall environment will be protected at all times. Work areas will be clean and tidy at the end of each day. Dust and vapor barriers will be set up to protect areas not presently being worked on as needed. Our preparation is extensive and vital to the longevity and beauty of our work. Prep includes removing failing paint, sanding, filling holes, repairing texture, caulking, cleaning and priming. All surfaces will be painted with at least two coats of high quality paint. All aspects of our work are top quality and will leave you with a great looking, long lasting paint job that will protect your home and investment. We will leave a consolidated and labeled touchup kit. We work to reduce the environmental impact of our work as much as possible. We keep the waste generated to a minimum, we recycle, reuse or donate any unused material and have low VOC paints available. Clear definition of the scope of your project, costs and time frame. References are provided. The best way to find out about our top quality services is to ask our customers. Masking all floors, windows, doors, and hardware. Removal of fixtures and electrical faceplates. Your household furnishings and environment will be protected at all times. Dust and vapor barriers will be set up to protect areas not presently being worked on as needed. We will leave your home as clean or cleaner than we found it. 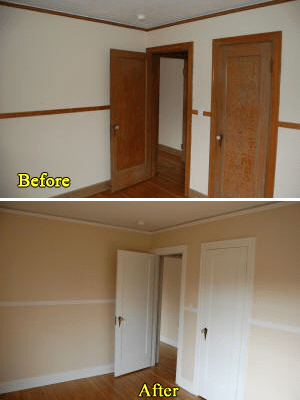 Wallpaper removal, surface cleaning, and removal of nails and repair of holes. Minor drywall repairs. Sanding and caulking as needed. Any patching and repairs will be primed for excellent quality and durability. Application of primer and a minimum of two top coats of high-quality interior paint. Custom colors and color consultation available. Low and no VOC (environmentally friendly) paints are available. Trim (such as base, door jams, crown molding and Waynes coating, chair rails) can be one of the most important parts of your paintjob. We take extra care to ensure the beauty and longevity of your trim. All trim will be sanded; cleaned; holes and imperfections filled; repaired; and calked where needed. Any bare wood patching and repairs will be primed for excellent quality and durability. We will spray or brush your trim based on your needs, the environment we're working in and the type of finish.